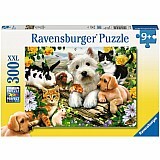 This is the puzzle for puppy lovers! There are 12 different kinds of puppies in this absolutely adorable puzzle! Recommended for ages : 11 to 12+.